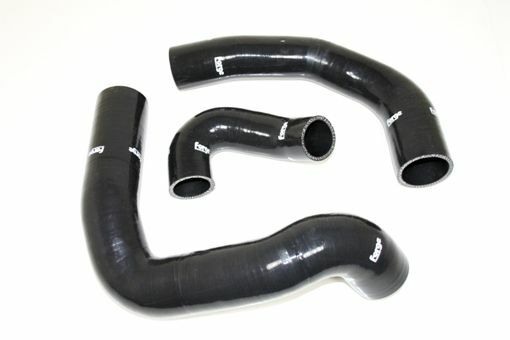 A set of three silicone boost hoses for the Ford Focus ST. These hoses are designed to withstand higher temperatures and pressures, than the originally fitted hoses. If you have a tuned engine, this alone would be the perfect reason for fitment, but as they look stunning and improve the looks of any engine, they are a great complement for a standard engine as well. The Forge Motorsport Silicon Boost Hose Set for Ford Focus ST 2.0 EcoBoost Engines streamlines airflow for better performance. A set of three silicone boost hoses for the Ford Focus ST. With a combination of high grade European Silicone and fabric re-inforcement, these hoses are designed to withstand higher temperatures and pressures, than the originally fitted hoses. If you have a tuned engine this alone would be the perfect reason for fitment, but as they look stunning and improve the looks of any engine, they are the perfect addition for a standard engine as well.